72 hours notice on all reservations, that is, 72 hours from 4 pm check in on the day of arrival. Cancellations made within 72 hours of scheduled arrival maybe be subject to a charge for one night's stay, if room cannot be rented. Refunds cannot be granted for weather conditions. Holiday reservations are non-refundable. 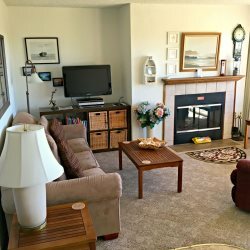 Hi-Tide Resort is committed to providing its guests and associates with a smoke free environment, and is proud to boast one of the most comprehensive smoke-free condo policies in the industry, in accord with Washington State Law. This Smoke-Free Policy has received praise from guests & staff, and Hi-Tide Resort LLC remains committed to achieving a smoke-free environment in all of its properties. The continuing efforts of these properties to comply with the smoke-free policy reinforces Hi-Tide Resort LLC's commitment to being an environmentally friendly company. This includes cigarettes, cigars, pipes and any other devices used in the consumption of smoke. The consumption of Marijuana, while now legal in Washington State, is not permitted on Hi-Tide Property. Smoking is not permitted in any residence. A $ 250 fee may be charged for ionization, if smoking in the property is detected. Hi-Tide Resort is committed to providing its guests and associates with a clean & fresh environment, and is also proud to allow Man's Best Friend to enjoy a vacation. There's a maximum of two dogs per condo. Dog fees are charged at $18 per dog per night. Hi-Tide Resort LLC remains committed to achieving a doggy friendship within it's properties. The continuing efforts of these properties to comply with the Dog Policy reinforces Hi-Tide Resort LLC's commitment to being an environmentally friendly company. However, we ask that all dogs are kept off the furniture, out of the beds and on-leash when on Hi Tide property. Your cooperation is appreciated in this matter. We look forward to welcoming you and your pet!